Amb. Thomas, who is also Liberia’s top diplomat near Beijing, the People’s Republic of China, is the first Liberian Envoy accredited to the Lao PDR since the two countries established diplomatic relations on August 12, 2016. During his audience with President Vorachith, Amb. 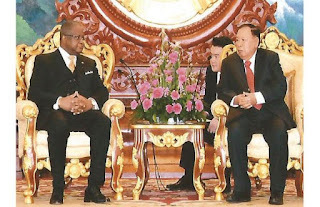 Thomas conveyed the good wishes of President Ellen Johnson Sirleaf for the health and longevity of President Vorachith, and for the prosperity and continued well-being of the Government and people of the Lao PDR. Amb. Thomas further expressed the desire of President Sirleaf and the Government and people of Liberia to establish, develop, promote and expand a relationship with the Lao PDR for the mutual benefit of the two countries and peoples, which he foresees will grow from strength to strength. He indicated that Liberia and Lao PDR, as developing countries, face similar challenges in providing for the health, education and the general well-being of their respective people and their future development. “I believe that Liberia and Lao PDR can share experiences; we can learn from each other as both of our countries pursue the goal of sustainable development,” Amb. Thomas stressed, identifying food security as an important area. “We understand that Lao PDR is self-sufficient in rice production, and is now exporting to China and other countries,” he said, adding, “Liberia’s staple diet is also rice, which the government would welcome a rapid acceleration of efforts to establish a bilateral cooperation mechanism between the two countries, which would help Liberia move from being an importer to that of becoming self-sufficient and an exporter of rice in the West Africa region in partnership with Lao PDR,” Ambassador Thomas urged. He noted that the development of Liberia’s agriculture sector is one of the primary goals of the Liberian Government under the leadership of President Sirleaf, which she is keen to promote at every given opportunity. Earlier, President Vorachith assured Amb. Thomas of his country’s support to Liberia and indicated his government’s consideration of requests for assistance in the areas of rice production and electricity. President Vorachith used the occasion to extend an official invitation to President Sirleaf to visit Laos. The ceremony was attended by Vice Minister of Foreign Affairs, Mrs. Khamphao Ernthavanh; Director General of Asia Pacific and Africa, Mrs. Fongsamoud Anlgvanh; the Director General of the Protocol Department; and Seng Soukhathirong. Amb. Thomas was accompanied to Vientiane Lao PDR by the Second Secretary and Vice Consul at the Liberian Embassy near Beijing, Moses Barclay. Laos, officially the Lao People’s Democratic Republic, and commonly referred to its colloquial name of Muang Lao, is a landlocked country in the heart of the Indo-Chinese Peninsula of mainland South East Asia, that is bordered by Myanmar and China to the northwest, Vietnam to the east, and Cambodia to the southwest.